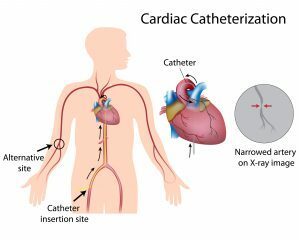 Cardiac Catheterization is a test used to evaluate your coronary arteries and your heart valve function; it will identify the size and location of plaques that may have built up in your arteries from atherosclerosis, the strength of your muscle, and the adequacy of valve function. Check the pressure in the four chambers of the heart. Take blood samples to measure the oxygen content in the four chambers of the heart. Inject dyes into your coronary arteries or arteries elsewhere in your body to trace the movement of blood through chambers of the heart. By watching the dye move through your heart’s chambers and blood vessels, your cardiologist can see whether the arteries are narrowed or blocked, and whether the valves are working properly. Typically the patient is awake during the procedure. The patient is given medications to help them relax. Recovery time for a cardiac catheterization is relatively quick, and there’s a low risk of complications.